The Spanish make great wine. But they also like playing around with their wine too. Sangria is the most famous, but there are other ways that the Spanish fortify, aromatize and dilute their wine. And they're all better than Sangria. 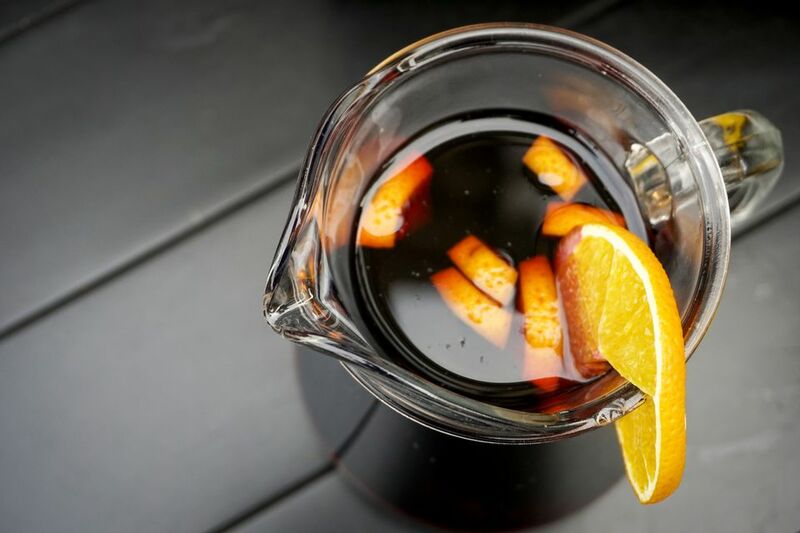 Here you'll find a few of the best equivalents to sangria that are common in Spanish bars. They are all traditionally Spanish, wine-based beverages that you will find the locals drinking, not just tourists. Go straight to the first one, tinto de verano, or read on for why you should avoid sangria in a bar in Spain. The Spanish treat sangria like you probably drink punch. Not following? OK. When would you drink punch? At a house party, right? That's when the Spanish drink sangria. Why would you offer your guests punch at a house party? Because it's cheaper than offering everyone free beer, right? But because you're buying cheap alcohol, you need to sweeten it and do stuff to it to make it drinkable, wouldn't you say? That's why the Spanish make sangria at a party. What would you do if you saw a bunch of tourists in your local bar drinking punch because that's what they thought the locals drink You'd laugh at them, wouldn't you? You get the picture! OK, so you understand the Spanish don't drink lots of sangria and you don't mind looking like a tourist (you are one, after all). Should you get sangria in a bar? Would you recognize good sangria? If not, your barman can probably tell! And that's precisely the problem: they know you don't know any better, so you're unlikely to get a good drink. First, you're in a bar that never makes sangria and doesn't have a recipe to hand. The barman won't want to lose a sale, knows you won't know the difference, so will probably just serve you red wine and lemonade, also known as tinto de verano. Second, you're in a bar that advertises it sells sangria. This means you're probably in a bar for tourists. Good sangria is strong. But there's no point in a bar serving you sangria with a big slug of brandy in it if you wouldn't be able to tell the difference. So what you're left with is the aforementioned red wine and lemonade, just garnished with fruit and cinnamon. That's not sangria. Tinto de Verano, or 'Summer Wine' is the drink of choice in the hot summer months in southern Spain (if you're not drinking beer, that is). It's simply red wine, ice and Fanta Lemon (or equivalent). It's delicious, it's cheap and it's easy to make, so no bar will ever get it wrong. It's the most obvious alternative to sangria for any first-time visitor to Spain. 'Tinto de Verano' is this drink's fancy name. The simpler, more precise name is just 'tinto con limón' - 'red wine with (sparkling) lemon'. You should order it like this for two reasons. One, you'll sound less like a tourist. Two, specifying you want it with sparkling lemon means you won't get a drink made with gaseosa, a sweetened sparkling water that tastes gross. Calimocho (or Kalimotxo in Basque) is similar to tinto de verano, but instead of sparkling lemonade, they use Coca-Cola. That's right, ​in Spain you can get red wine mixed with Coke. And you know what? It's great! Calimocho is popular with three kinds of people in Spain: teenagers and students; people attending the Pamplona Running of the Bulls; and heavy metal fans. Sweet vermouth, though originally Italian, has a long history in Spain. And it's coming back. Vermut, as the Spanish call it, is now being drunk again in large quantities in tiny vermuterias all over the country. Vermouth is aromatized white wine (yes, even sweet vermouth is made from white wine), with herbs and other alcohol and flavorings added (to make it into dark sweet vermouth, caramel is added). So, really, by that description, it's not a million miles away from sangria, is it? For those who don't work in the afternoon (or don't care about their work), there is la hora del vermut, which loosely translates as 'Vermouth o'clock', which is just before lunch. Vermouth is an aperitivo and is the perfect way to get your hunger up for lunchtime tapas! Any bar that has a sign saying they sell it. If you don't see a sign that says they sell it, then it's probably just a dusty bottle of Martini Rosso they'll have somewhere behind the bar. There are some particularly beautiful vintage vermuterias in the Gracia district of Barcelona. There's even a Vermouth Walking Tour of Barcelona that we recommend. Sherry is, admittedly, a long way from sangria. But it is, perhaps, wine for people who don't like wine. And it is often sweetened. There! I've made my sangria connection! Sherry is a fortified wine, made only in the tiny triangle between Jerez, Sanlucar de Barrameda and El Puerto de Santa Maria in the Cadiz province of Andalusia. Whatever type of sherry you try, it'll have a unique taste to it, which is usually acquired, but get a tasting and you'll probably acquire it rather quickly! Where should you drink sherry? In the Sherry Triangle would be best. Don't think that because the Spanish are so good at fortifying, aromatizing and diluting their wine that it isn't good to begin with. Spain makes a lot of fantastic wine all over the country. Ribera del Duero and Rioja are the two most famous wine regions in Spain. We're also a big fan of Toro wines, which have been improving over recent years to be very drinkable but with a lot of body. There are good wines all over.